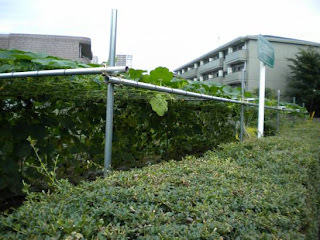 Japan Farmers Markets: Squash Trellis: Updated! Trellis' seem to be a favorite topic of gardeners as the search for space to grow just one more thing continues. Farmers and growers in Japan and Tokyo have pondered the same question for generations. Here's one of the solutions spotted at a nearby farm. As a self-confessed vegetable geek who helps at an organic farm in Tokyo and has a garden, I still get an irresistible urge periodically to head out to the local vegetable stands to see what's on offer. Inevitably a good deal, I usually come away with a little Japanese practice, a recipe, and sometimes a new vegetable. The other day I came away with a new idea. Update: The area underneath is used to grow some winter greens when the squash is finished up. This last year I spotted cabbage happily growing in the space below. The trellis itself runs along the south end of what is now a large and busy garden, but at one time must have been part of a much larger field. (I surmise this based on the size of the adjacent farmhouse and bamboo grove, both of which are some of the largest I've seen in this area.) A grape arbor with the ripening clusters in little white bags at the moment to protect them from greedy birds and bugs runs along the north end as does a rather long row of sunflowers. The associated vegetable stall while a bit out of the way, is still one of my favorites and always worth a visit. Update: Another neighboring farm has a trellis made of the same heavy duty materials. The set up is permanent, which means the same crop is planted in the same place each year. This strikes me as risky for disease and pests, which is the only drawback of this kind of structure. On the other hand, the cucumber trellis we set up at our farm is not permanent. The ability to move it around from year to year while mildly tedious is probably safer in the long run. I've done something similar with chilacayote (Cucurbita ficifolia), the most vigorous squash that will grow in Britain. It will climb up trees, even in our cool climate and the head sized squashes look beautiful, although they must surely be a serious danger to people walking underneath. The RHS garden at Rosemoor have used a weld mesh arch to grow chilacayote in the past - very impressive. Those are beautiful. (Just looked them up.) 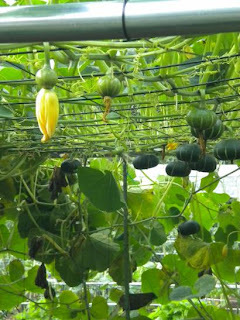 A fellow up the road grows snake gourd (Trichosanthes cucumerina, I think) and they climb up his trellis, over the fence, and fill a tree in his garden. They are freakishly beautiful. He doesn't eat them, but just grows them for show. What a great idea. We are getting so many plants eaten in our community garden this year. If there was a way to make this portable (i.e. put it up, take it down) because we can't leave items in our community garden past the gardening season, this would be perfect (except for finding a way to store it). There is a portable version (see cucumber post for this season), but yes, storage is the tricky part. At least you've got a good harvest!